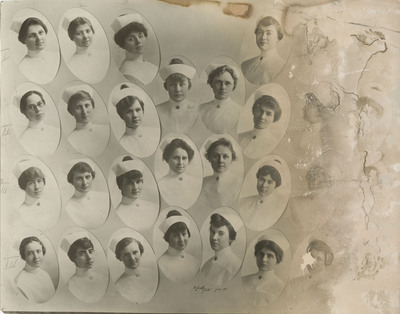 This image features individual class photos of the Good Samaritan School of Nursing class of 1918. Discoloration and change in texture to the right of the image indicate a water stain. Bushnell Photo, "Good Samaritan School of Nursing Class of 1918" (1918). Good Samaritan School of Nursing Photographs. Image. Submission 64.